Our PRINCIPAL Plan is affordable, essential protection from those big, unexpected repairs, covering many engine and transmission breakdowns. In addition to PRINCIPAL, our PLUS Plan adds common items that can stop you in your tracks such as water pump, turbocharger, exhaust manifolds and more. 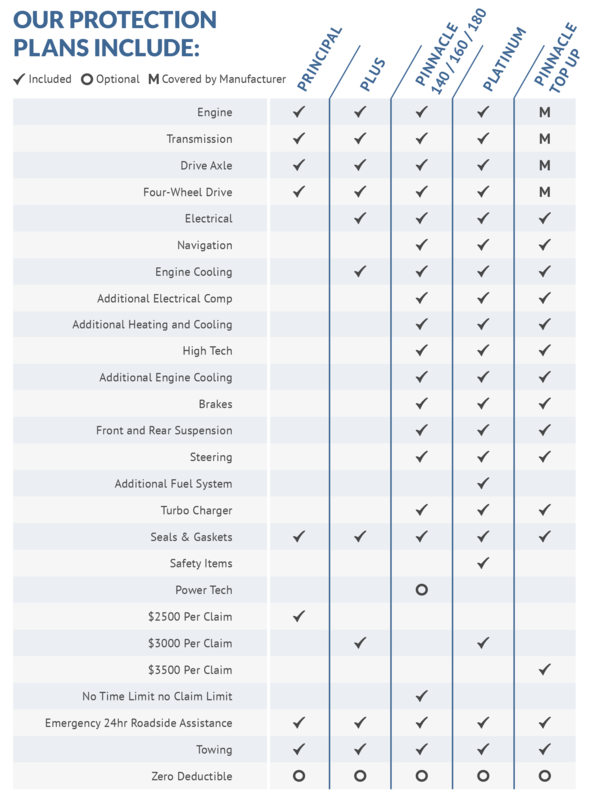 PINNACLE Plan expands on all of the above to include such hefty repairs as navigation and main radio entertainment unit, heating and cooling, suspension, fuel delivery components and more. PINNACLE coverage is available with no claim limit and no time limit. PLATINUM coverage is our most extensive coverage, and gives you the greatest number of covered components. Ask your dealer about this industry leading protection plan. When your vehicle still has factory coverage on the powertrain, however the comprehensive portion has ended our TOP UP Plan steps in to cover many of those comprehensive items. This popular warranty runs side by side with the term and mileage of your factory’s powertrain warranty. When you want the assurance that the technical features on your vehicle will keep you safe and connected, our POWER TECH option delivers. This popular option covers the backup camera, park sensors, power folding mirrors and their switches, power sliding door motors and their switches, power taildoor motor and switches, blend door (for heating system air circulation), Bluetooth transmitters and receivers. Many warranty companies cover some or all of your breakdowns however, they literally leave you on the Hook for towing and emergency roadside assistance, requiring you to Pay out of Your pocket. ALL of Canada General Protection Plans Include Emergency Roadside Assistance and Towing along with; Lockout service, Tire Change, Battery Boost, Cold Weather Starting, and Delivery of Fuel! There is no ideal time for a Breakdown and We want to make it as easy as it can be on You. Our regular GAP covers most situations and is excellent coverage against loan deficits when insurance coverage comes up short. Our unique and innovative DOUBLE GAP product is peace of mind for those consumers bringing additional negative equity up to $15,000 into their vehicle purchase. Ask your dealer about Canada General GAP and DOUBLE GAP. ** For full list of covered components on all our plans, ask your dealer or refer to your vehicle service contract.